It’s been nine long months since Sherlock returned from the apparent grave, then promptly disappeared into the ether once more after another all-too fleeting run on the BBC. 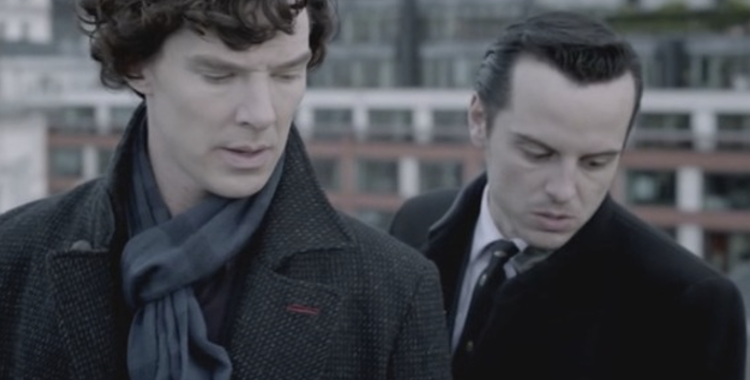 Shooting is set to begin on a Christmas special in early 2015 followed by filming for series four as Moffat and Gatiss set about resolving the Moriarty return cliff-hanger of His Last Vow. But it’s another series cliff-hanger that continues to generate comments and speculation and just refuses to go away – how did Sherlock fake his own death at the end of the Reichenbach Fall? And there lies both the problem and the inevitable underwhelming solution. No matter which scenario was presented to the viewers after two years of fervent speculation and wild fan theories, the overall result was never going to satisfy everyone. Both Moffat and Gatiss were only too aware of this conundrum, and responded in a highly satirical manner. How? By changing the character of forensic specialist Phillip Anderson. Anderson’s character was changed in such a way that he would represent the show’s audience within the show itself. Not quite breaking the fourth wall, but providing enough of an obvious reference to represent the more ‘enthusiastic’ members of the audience. He concocted unrealistic theories, pined for the return of Sherlock, and hero-worshipped to an obsessive degree. When Anderson, in his guise as the audience representative, is given the explanation by Sherlock at the end of the episode he expresses his disappointment, accepts the reality…. and then picks apparent holes and inconsistencies in the scenario he’s been given. His reaction to his own reluctance to accept the version of events is one of madness – a further satirical take on anyone still speculating as to the true solution of the fall. Whether you accepted this solution or not the fact remains: there are only so many ways you can jump off a building and survive – all of them are disappointing. From serial suicides to monstrous hounds, the disproving of miracles is something Sherlock does on a regular basis. No one should be disappointed – it’s a trick…just a magic trick.